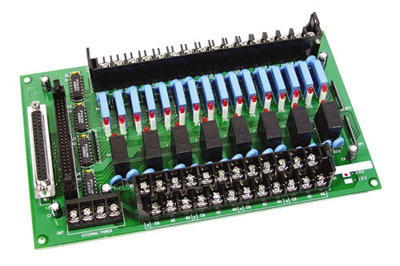 The OME-DB-24PR 24-Channel power relay output board consists of 8 form C and 16 form A electromechanical relays for efficient switching of loads by programmed control. The contact of each relay can control a 5 A load at 250 Vac/30 Vdc. The relay is energized by applying a 5 voltage signal to the appropriate relay channel on the 50-pin OPTO-22 compatible connector, 37-pin D-sub connector (OME-DB-24PRD only) or 20-pin flat cable connector (OME-DB-24PR only). Twenty-four enunciator LED ’s, one for each relay,light hen their associated relay is activated. To avoid overloading your PC ’s power supply,this board needs a +12 Vdc or +24 Vdc external power supply. 참고: Each board includes complete operator’s manual on CD ROM.